This post is a Twitter Ads case study. In it, I'll tell you how I used social media monitoring to shape better audiences for Twitter ad campaigns, which resulted in 11X more traffic from ads and a 8.5X lower cost-per-click - without an extra penny spent. The success of a PPC (pay-per-click) campaign largely depends on the targeting. No matter how good your product, ad creatives, and landing pages, the campaign will inevitably fail if exposed to the wrong audience. And while Twitter does offer a bunch of targeting options, they aren't always flexible and precise enough for advertisers with low budgets. That's why I decided to try hand-crafting the audience for my Twitter campaign with the help of social media listening to find the exact users that will be interested in my the ads - and it worked like magic. Twitter offers a bunch of targeting options to choose from. 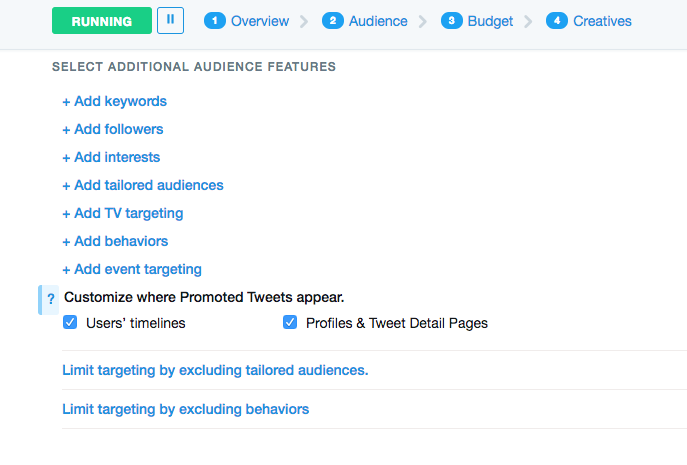 You can see them all in your Twitter Ads account at Step 2 (‘Audience’) of creating a new campaign. Keywords – targets users who tweet with words you enter. Followers - allows you to reach users with interests similar to the followers of the accounts that you specify. 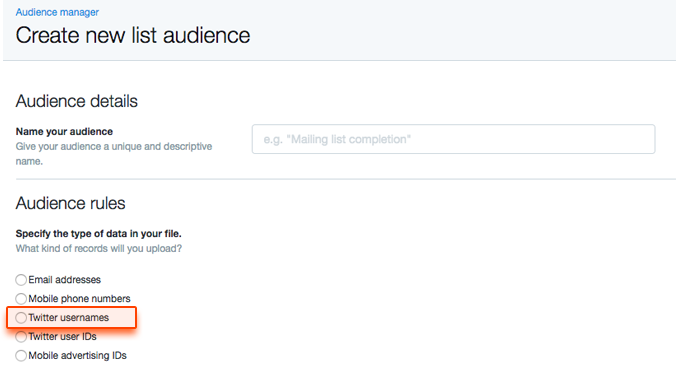 Tailored audience – upload your own lists of users. Events - event targeting reaches people interested in global or regional events. There are also TV and behavior, but these methods are not available in all countries. In this article, I'll focus on the first three targeting methods. I used to rely on the Keywords option heavily, but eventually switched to Followers and Tailored audience. At the end of this post, you'll see why. Targeting by keywords is pretty straightforward – your ads will be shown to the people whose tweets contain the words you specify. This is the targeting method I used previously with relatively little results. While I do believe that it can be useful for corporations with big advertising money, it has one drawback for advertisers with lower budgets: the natively available match types are not flexible, so you may be getting lots of untargeted traffic. I will illustrate it with a simple example. Only the last tweeter is likely to be a good fit for my campaign. Sure thing, I've tried using negative keywords to narrow the audience down - but hours of research, copying, and pasting have yeilded hardly any results. I've found this targeting method to be extremely effective. It allows you to target people with similar interests to those of the followers of the Twitter accounts you specify. For example, if I follow @adidasoriginals, chances are that I’m an Adidas fan and show strong interest in new shoes or garments of the brand. The trick here is to find a list of influencer accounts that will yield the desired results. At the time of this writing, Twitter allows adding up to 50 accounts that will be used to shape the target audience. I am not sure whether it’s too many or too few, but I know one thing for sure: it takes a lot of time to find all these accounts manually. More to that, it’s useful to take into consideration the accounts' number of followers and their relevance (do they tweet about the subject often?). The latter is impossible without a social media tool. Let’s get from theory to practice and collect the list of Twitter usernames for your first tailored audience. Here's how I got my own tailored audience segment that resulted in a dramatic increase in engagement and traffic to the website. I logged in to Awario and created an alert. Then I chose ‘Boolean search’ to formulate my query. The ‘Search query’ field may be a little tricky if you're doing this for the first time (but I promise you'll be thanking the universe for it once you've figured out how it works). 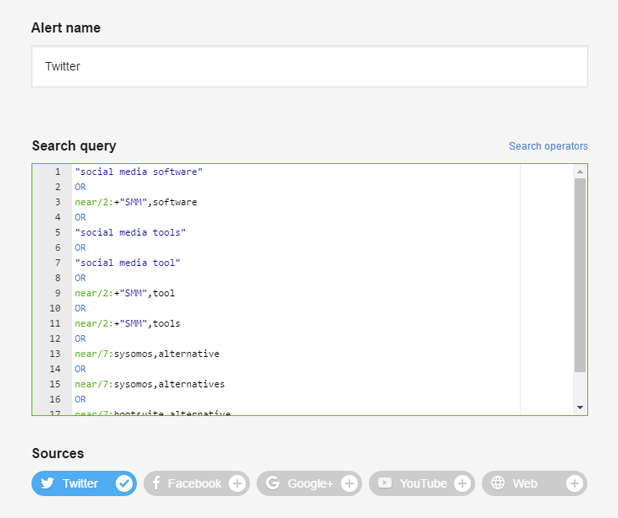 The idea behind Boolean search is that you can specify custom queries, however long and complex, to make sure you find exactly the results you're looking for. Boolean operators are the logical links that indicate the relationship between the terms in your query. For example, AND signifies that you're looking for a result that contains both terms; OR means you'll find results that contain either of the terms; NOT works like a negative keyword match, meaning that results containing a specified term will not be shown to you. Jump here for a full reference on Boolean operators and syntax. The query above may look daunting until you break it into simpler elements. Let’s see what they mean. near/2: tells the program to look for the specified keywords within 2 words from each other, i.e. there should be no more than 2 words between the terms "SMM" and "sofware". "social media tools" and other phrases in quotes mean we are looking for an exact phrase match. OR tells the program to return results that match at least one of the expressions linked with this operator. 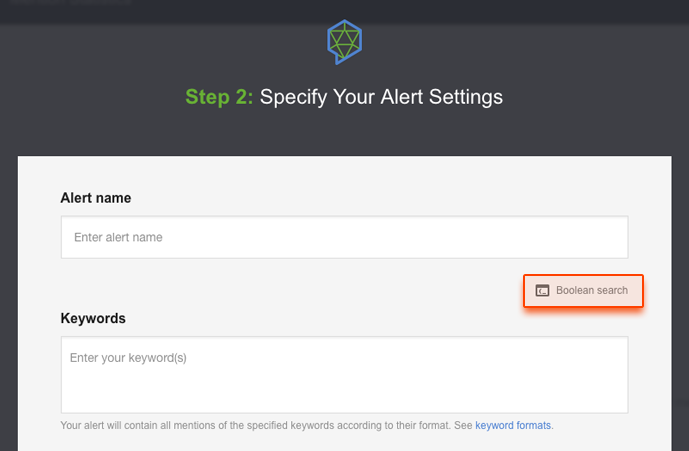 Finally, don't forget to give your alert a name and deselect all data sources except Twitter. When you're done, just click "Get mentions" to start the search. In the export file find the column “Author Username”, make sure you remove all duplicate usernames from the column if there are any. Get read of leading or trailing spaces around the usernames. Due to privacy concerns, the list must include at least 500 records for it to be usable in your campaigns (ideally, try to make it 1,000 or longer). Mind that Twitter will accept only properly formatted .txt and .csv files. To avoid errors, I highly recommend to hash the file with SHA256, especially if you are working with a heavy file. Your first tailored audience is ready! Let's build one more tailored list (this time for the Followers targeting option), and then see how you can import both files into Twitter. Now we'll be looking for the most influential Twitter accounts in your niche, so that we can later use this list for followers-based ad targeting. This is going to be easy if you followed the previous step - you'll need to use the same alert you just created. In my case, I was looking for accounts that tweet about social media marketing, social media management, social media tools, etc. The followers of such accounts are likely to be a good audience for the campaign. All I did was go to the Influencers report in the alert. If you do the same, you'll see the authors with the biggest number of followers that have tweeted about your keywords. If you have several alerts in Awario, make sure to select the right one in the drop-down menu in the top left corner. 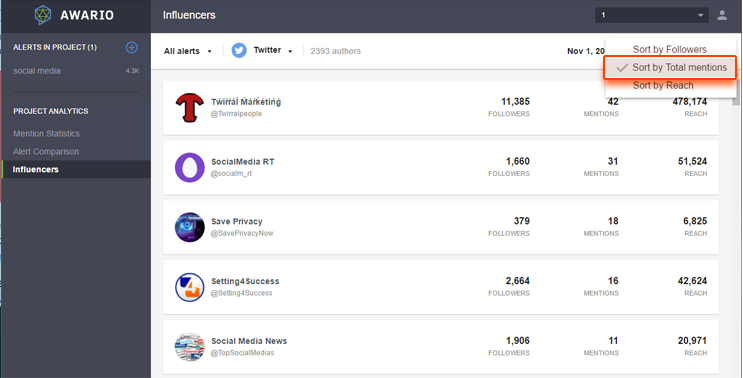 You can also choose to sort the influencers by "Total mentions" (and not by the number of followers). This is often a wise thing to do - instead of a list of people who've tweeted about your keywords once or twice, you'll see the ones that are really interested in the topic. Unfortunately, there is no option to directly export the list of influencers in .csv. That's why you'll need to manually copy the data from the report and paste it into a spreadsheet. Remove all records except for the usernames, and this time do not delete the “@”. Importing your laser-precise selection of Twitter users into Twitter Ads is the final step. Let’s begin with the accounts that we collected first ("Tailored audience"). Log in to Twitter Ads and proceed to Tools > Audience Manager. On the next screen, click on the Create New Audience drop-down button and select Upload your own list. Provide a descriptive name for the audience, specify Twitter usernames as the data type, and upload your .txt or .csv file. Hooray - you can now use this audience in your ad campaigns! Note: from what I observe, it’s good to SHA256 encode the files you upload, especially when it comes to the bigger usernames lists (over 50K items). Twitter will often stall at the mysterious ‘audience too small’ status if you don’t encode the files. Now let's import your other file - the list of influencers for followers-based targeting. On the next screen, click on the Create New Audience drop-down button and select Add followers. Copy the list of usernames from your file, click on Import multiple @usernames, and paste your list into the field. That was it - the process is fairly simple and will likely take you under 30 minutes (and much less than that when you do it for the second time). If you're still in doubt, here's one final inspirational screenshot. The first two campaigns have been created with the two methods above; the third one is a regular keyword-based campaign that most advertisers use. Now over to you. Do you have similar success stories about social media advertising or creative ideas to share? Let me know in the comments!